An image depicting Eagle syndrome can be seen below. Radiographs of the vertebral spine: a-p and lateral view. Neither distinct malposition nor major degenerative changes of the cervical spine are recognizable. The ligamenta stylohyoidea on both sides is largely ossified. The patient's medical condition might be ascribed to a kerato-stylohyoidal syndrome. Blood work is required to exclude possible systemic diseases. A complete blood count (CBC) is obtained if infection is suspected. Lateral view radiographs of the skull can be substituted for panoramic radiographs of the mouth; the disadvantage of this view is the overlapping between styloid processes of both sides and/or with adjoining bony structures. An advantage of orthopantomogram (panoramic view) is that the entire length of the process can be seen very distinctly and its deviation can also be made out clearly. Computed tomography (CT) scanning (and in particular three-dimensional [3-D] CT scanning) represents an extremely valuable imaging tool in patients with Eagle syndrome, offering an accurate evaluation of the styloid process in relation to its anatomical relationship with the other head and neck structures. Additionally, reproduction of the patient’s pain on palpation of the tonsil or tonsillar fossa and relief of this discomfort by injection of local anesthetic are diagnostic. The two traditional surgical approaches to styloidectomy (removal of the elongated portion of the styloid process) are the intraoral approach (or transpharyngeal) and the extraoral approach. A specific orofacial pain secondary to calcification of the stylohyoid ligament or elongated styloid process has been known as Eagle syndrome (ES) since 1937, when an otolaryngologist at Duke University, Watt W. Eagle, described the first cases. This syndrome was characterized by symptoms typically occurring after pharyngeal trauma or tonsillectomy. It manifests as a nagging dull, long-term ache in the throat, sometimes radiating to the ipsilateral ear and the sensation of a foreign body in the throat. Occasionally, it manifests as odynophagia, dysphonia, increased salivation, and headache. Not rarely, patients believe that they have not properly healed from their tonsillectomy. 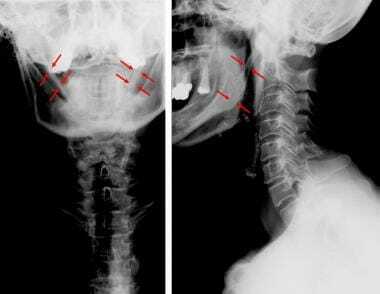 In the ensuing years, the term "styloid syndrome" was created to describe a cervico-pharyngeal pain related to the styloid process when no previous history of trauma was found. An elongated styloid process occurs in about 4% of the general population, while only a small percentage (between 4-10.3%) of these patients are symptomatic. So the true incidence is about 0.16%, with a female-to-male predominance of 3:1. Bilateral involvement is quite common but does not always involve bilateral symptoms. No significant difference is detectable between the right and left sides. The “classic Eagle syndrome” is typically seen in patients after pharyngeal trauma or tonsillectomy, and it is characterized by ipsilateral dull and persistent pharyngeal pain, centered in the ipsilateral tonsillar fossa, that can be referred to the ear and exacerbated by rotation of the head. A mass or bulge may be palpated in the ipsilateral tonsillar fossa, exacerbating the patient’s symptoms. Other symptoms include dysphagia, sensation of foreign body in the throat, tinnitus, or cervicofacial pain. The “second form” of the syndrome (“stylocarotid syndrome”) is characterized by the compression of the internal or external carotid artery (with their peri-vascular sympathetic fibers) by a laterally or medially deviated styloid process. It is related to a pain along the distribution of the artery, which is provoked and exacerbated by rotation and compression of the neck. It’s not correlated with tonsillectomy. In case of impingement of the internal carotid artery, patients often refer supraorbital pain and parietal headache. In case of external carotid artery irritation, the pain radiates to the infraorbital region. Elimairi I, Baur DA, Altay MA, Quereshy FA, Minisandram A. Eagle's Syndrome. Head Neck Pathol. 2015 Dec. 9 (4):492-5. [Medline]. [Full Text]. Bokhari MR, Bhimji SS. Eagle Syndrome. 2017 Jun. [Medline]. [Full Text]. Moffat DA, Ramsden RT, Shaw HJ. The styloid process syndrome: aetiological factors and surgical management. J Laryngol Otol. 1977 Apr. 91(4):279-294. [Medline]. Kaufman SM, Elzay RP, Irish EF. Styloid process variation. Radiologic and clinical study. Arch Otolaryngol. 1970 May. 91(5):460-3. [Medline]. Lindeman P. The elongated styloid process as a cause of throat discomfort. Four case reports. J Laryngol Otol. 1985 May. 99(5):505-8. [Medline]. Correl R, Jensen J, Taylor J et al. Mineralization of the stylohyoid-stylomandibular ligament complex: A radiographic incidence study. Oral Surg Oral Med Oral Pathol. 1979. 48:286-291. Langlais RP, Miles DA, Van Dis ML. Elongated and mineralized stylohyoid ligament complex: a proposed classification and report of a case of Eagle's syndrome. Oral Surg Oral Med Oral Pathol. 1986 May. 61(5):527-32. [Medline]. Montalbetti L, Ferrandi D, Pergami P, et al. Elongated styloid process and Eagle's syndrome. Cephalalgia. 1995 Apr. 15(2):80-93. [Medline]. Monsour PA, Young WG. Variability of the styloid process and stylohyoid ligament in panoramic radiographs. Oral Surg Oral Med Oral Pathol. 1986 May. 61(5):522-6. [Medline]. Balcioglu HA, Kilic C, Akyol M, Ozan H, Kokten G. Length of the styloidprocess and anatomical implications for Eagle's syndrome. Folia Morphol (Warsz). Nov 2009. 68:265-70. [Medline]. Oztunç H, Evlice B, Tatli U, et al. Cone-beam computed tomographic evaluation of styloid process: a retrospective study of 208 patients with orofacial pain. Head Face Med. 2014 Feb 15. 10:5. [Medline]. [Full Text]. Han MK, Kim do W, Yang JY. Non Surgical Treatment of Eagle's Syndrome - A Case Report. Korean J Pain. 2013 Apr. 26(2):169-72. [Medline]. [Full Text]. Eagle W. Elongated styloid process: Further observation and a new syndrome. Arch Otolaryngol. 1948. 47:630-640. Eagle W. Elongated styloid process. Report of two cases. Arch Otolaryngol. 1937. 25:584-587. Lentini A. Gli aspetti clinici e radiologici delle anomalie dell'apparato stilo-joideo. Radiol Med. 1975. 61:337-3640. Epifanio G. Processi stiloidei lunghi e ossificazione della catena stiloidea. Rad Prat. 1962. 12:127-132. Gokce C, Sisman Y, Sipahioglu M. Styloid Process Elongation or Eagle's Syndrome: Is There Any Role for Ectopic Calcification?. Eur J Dent. 2008 Jul. 2 (3):224-8. [Medline]. [Full Text]. Bruno G, De Stefani A, Balasso P, Mazzoleni S, Gracco A. Elongated styloid process: an epidemiological study on digital panoramic radiographs. J Clin Exp Dent. 2017 Dec. 9 (12):e1446-52. [Medline]. [Full Text]. Sekerci AE, Soylu E, Arikan MP, Aglarci OS. Is there a relationship between the presence of ponticulus posticus and elongated styloid process?. Clin Imaging. 2015 Mar-Apr. 39 (2):220-4. [Medline]. Baddour HM, McAnear JT, Tilson HB. Eagle's syndrome. Report of a case. Oral Surg Oral Med Oral Pathol. 1978 Oct. 46(4):486-94. [Medline]. Frommer J. Anatomic variations in the stylohyoid chain and their possible clinical significance. Oral Surg Oral Med Oral Pathol. 1974 Nov. 38(5):659-67. [Medline]. Texier C, Dang NP, Dallel R, Deschaumes C, Garcier JM, D'Incan M. Eagle syndrome, a rare cause of glossodynia. Eur J Dermatol. 2012 Sep-Oct. 22(5):702-3. [Medline]. Kouki S, Guerfel M. Eagle's syndrome presenting as a cervical mass. BMJ Case Rep. 2013 Oct 31. 2013:[Medline]. Song JH, Ahn SK, Cho CB. Elongated styloid process as a cause of transient ischemic attacks. JAMA Neurol. 2013 Aug. 70(8):1072-3. [Medline]. Naito Y, Yamazaki K. Perioperative management of Eagle syndrome complicated by carotid artery dissection. J Anesth. 2013 Sep 29. [Medline]. Kumar P, Rayamane AP, Subbaramaiah M. Sudden death due to eagle syndrome: a case report. Am J Forensic Med Pathol. 2013 Sep. 34(3):231-3. [Medline]. Okur A, Ozkiris M, Serin HI, et al. Is there a relationship between symptoms of patients and tomographic characteristics of styloid process?. Surg Radiol Anat. 2013 Oct 26. [Medline]. Bouzaïdi K, Daghfous A, Fourati E, Kechaou I, Jabnoun F, Chtioui I. Eagle's syndrome. Acta Radiol Short Rep. 2013 Jul 11. 2(5):2047981613495676. [Medline]. [Full Text]. Kent DT, Rath TJ, Snyderman C. Conventional and 3-Dimensional Computerized Tomography in Eagle's Syndrome, Glossopharyngeal Neuralgia, and Asymptomatic Controls. Otolaryngol Head Neck Surg. 2015 Jul. 153 (1):41-7. [Medline]. Müderris T, Bercin S, Sevil E, Beton S, Kiris M. Surgical management of elongated styloid process: intraoral or transcervical?. Eur Arch Otorhinolaryngol. 2013 Aug 28. [Medline]. Chase DC, Zarmen A, Bigelow WC, et al. Eagle's syndrome: a comparison of intraoral versus extraoral surgical approaches. Oral Surg Oral Med Oral Pathol. 1986 Dec. 62(6):625-9. [Medline]. Chrcanovic BR, Custódio AL, de Oliveira DR. An intraoral surgical approach to the styloid process in Eagle's syndrome. Oral Maxillofac Surg. Sep 2009. 13:145-51. [Medline]. Torres AC, Guerrero JS, Silva HC. A modified transoral approach for carotid artery type Eagle syndrome: technique and outcomes. Ann Otol Rhinol Laryngol. 2014 Dec. 123(12):831-4. [Medline]. Ceylan A, Koybasioglu A, Celenk F, Yilmaz O, Uslu S. Surgical treatment of elongated styloid process: experience of 61 cases. Skull Base. 2008 Sep. 18(5):289-95. [Medline]. [Full Text]. Heim N, Faron A, Martini M, Reich RH. Eagle Syndrome: a Follow-Up Examination of Four Patients After Surgical Treatment Via Cervical Approach. J Craniofac Surg. 2017 Oct. 28 (7):1683-6. [Medline]. Jalisi S, Jamal BT, Grillone GA. Surgical Management of Long-standing Eagle's Syndrome. Ann Maxillofac Surg. 2017 Jul-Dec. 7 (2):232-6. [Medline]. [Full Text]. Chen R, Liang F, Han P, Cai Q, Yu S, Huang X. Endoscope-Assisted Resection of Elongated Styloid Process Through a Retroauricular Incision: A Novel Surgical Approach to Eagle Syndrome. J Oral Maxillofac Surg. 2017 Jul. 75 (7):1442-8. [Medline]. CT scan: calcification of the stylohyoid ligament. Special thanks to Jonathan George Hart.